As a relatively new photographer, I know little enough about where I have been on my journey, a bit more about where I stand today but, precious little about where I shall yet travel. That being said, I have a question about, perhaps, all three. When I was starting, the camera never left the "Auto" setting on the dial. I assumed that any computer knew better than did I. Sure, I might delve into the "Scenes" settings when I knew that I had a speciality shot that they seemed to cater to (bust out the running man for an action shot [the "running man" icon on the camera, not the iconic running man dance move of the early to mid 90s] or the sunset for a shot of that type) but mostly an Auto man through and through. Then as I read more about how the camera functioned I started to try and set my own settings. A big help was that many of my photo books included the meta data for the shots used as examples. I started to really understand what I needed to tweak in order to shift one side of the shutter speed/aperture scales to get what I wanted and trust the camera to put things into proper balance. My first question is based around the fact that I still need a couple of practice shots to get what I want. And that question is, are you able/do you expect to be able to make change to settings and nail the picture (seetings if not composition) at the first try? Just trying to assess whether or not that is a realistic goal. When I shot film, I do remember that I would burn a whole roll on a single shot that I really wanted to come out and of which I was less than certain I was dialed in. My second question is on an average shot, how manual are you? I know that it varies greatly based on all of the elements present but just an overly simple average. Are you manually tweaking focus, ISO, WB, aperture and shutter speed or are you still trusting the camera with one or more components? I am in full manual except for focus. Most of the time, I try to analyze what I want to accomplish with the shot. First, I evaluate shutter speed and aperture. If I need a fast or slow shutter speed, I choose what I think is best. Then I consider aperture. If I need a fast shutter speed but the combination of shutter speed and aperture doesn't produce sufficient light, I look at the ISO speed. If I'm shooting a waterfall and want to use a slow shutter speed and I stop down to the smallest aperture and still have too much light, I make sure my ISO setting is at 100. If there is still too much light, I'll use a polarizing filter and a neutral density filter if I need to. I'm always thinking about the technical stuff like that. If I am thinking about exposure, I should get the shot I want the first time. That said, I also think about whether the photo would look better with a blurred background or a sharp background. I will often take the photo as I initially thought about it, but then adjust to create a different effect. Regardless of the camera settings, composition is an issue. I usually try several different compositions. Too often, the ones I think will look great, end up being not so great. Sometimes I just make a photo and am surprised how the unplanned composition worked better than those I took a lot of time to compose. Another manual thing I do is look through the viewfinder for things that I don't want in the photo that can be moved. Finding a Coke can in the photo when you look at the shot means post processing work. Look through the viewfinder and search for things you don't want. Also look for things like "intersections"; a tree branch that covers up a key element in the photo. Adjusting your position can remove or realign elements in the photo before you trip the shutter. When I first got into photography I was a point and shoot kind of a guy. Now I spend a lot of time thinking. Before I talk about "me" and what I do, let me recommend that you purchase (if you haven't already) the book: "Understanding Exposure" by Bryan Petersen. I have several feet of photo books. IMO, it is THE single BEST book on fundamentals of how exposure works on an SLR/DSLR camera. I think the "automatic" settings on a serious camera are a complete waste of space and electronics. If you want to make photographic images that have professional quality and impact, turn all that auto stuff off and forget it was ever even on the camera. If I were king of the world and you said you wanted to become a photographer, I would make you buy a very old SLR and some Kodachrome 25 slide film. We would start from there. Thats anachronisitic of course. But there are certainly many parallels with modern digital "DSLR" cameras. To me the primary "fault" in your statement is that a computer can do better than you can. Computers are mind-blowingly capable of doing one thing -- computing. Humans still supply the "input" and clearly, the art. A computer doesn't "think." It is extremely literal in everything it does. For example, as I'll bet you already know, the exposure metering system on cameras is designed (an oversimplification to illustrate my point) to calibrate to a "neutral grey." So what does that mean? One thing it means is that everything you point the camera at -- the camera is going to try to portray it as neutral grey. Problem: Not everything we photograph SHOULD be neutral grey. While the modern camera's computer does have the ability to "adjust" it is based on putting hundreds of thousands of examples into it and asking the computer to make the closest match. Question is, if you could make it exactly what you want, why would you let a "dumb" computer guess at it? I look at it slighly differently than Al. I am mentally 100 manual, but I do often use either the Aperture Priority or Shutter Speed Priority settings. But I have a fundamental understanding of the the all manual camera and settings do. I use a very limited couple "auto" functions to make my life easier. You really need to understand the fundamental mechanics of a technically good exposure in order to use the camera effectively. There are some shots that you simply cannot make in any other way than using and understanding the camera's "manual" functions. There are only really only 3 variables: ISO, shutter speed and aperture. The "running man" just assumes that you want to use the fastest shutter speed in order to freeze action. But creative photographers know that sometimes the fastest shutter speed and frozen action do make the compelling image. If they do, why not control those variables yourself. Understanding the relationship between those variables means you do not need any special automatic settings. In answer to your other question, yes, I expect to "nail" the shot on the first take (technically). Once I understood the relationships between the 3 variables and how to properly meter and expose, I very seldom threw away a slide for poor exposure reasons (don't get me wrong -- I threw away a lot of them for other reasons). There are a very few instances in which we will take bracketed "insurance" shots. One of the really great aspects of the digital cameras today is that you can instantly check the results. When I take other shots, it is to try creative different shots, composition, etc. Usually, I will "cheat" a bit on exposure on my camera today by letting the camera make the intial exposure decision, check the histogram, and then adjust. When I am satisfied with the histogram, I then make the actual shot. I am currently almost entirely shooting in Shutter Speed or Aperture priority modes. I know what I want the camera to do and how the interaction occurs so I feel comfortable in those modes. I too often allow the camera free reign on the ISO and need to work on remembering to look at that setting before each and every shot, thank you for that comment Al. I recently purchased a variable ND filter as a way of adding an additional control to my shutter speed/aperture/iso balancing act. Excited to use it. And "excited" was also how I felt when I realized, no long ago, that I just knew better than the computer what I wanted to do with a certain shot and that Auto was mostly a thing of the past (I leave my camera on Auto whenever I am moving as I believe it gives me the best chance to capture something that might come up spur of the moment, when I don't necessarily have time to dial it in). Andy, your thoughts on the computer's necessary limitations is spot on. Thank you both again for the insights. Oh, and I added "Understanding Exposure" to the wish list I provided to the Santas in my family. Dean, the problem with using shutter speed or aperture priority is that you are choosing the one you want and you are letting the camera choose the other one. That's fine if, as Andy pointed out, that average is neutral grey. If you are shooting a winter scene, for example, your camera wants the snow to be grey not white, so a rule of thumb is when shooting bright whites or yellows, you should open up two stops. If you are shooting where there is a lot of blacks and shadow areas, your camera will want to make them grey. You can't trust your camera to make the right exposure, so you have to stop down one or two stops. What shutter speed or aperture would you select if you where shooting it? What aperture or shutter speed would your camera select if you were shooting in shutter speed or aperture priority? Unfortunately, the uploaded version of this photo doesn't show the detail contained in my original. But faced with a situation where you have a relatively bright sky but deep shadows in the rocks. How do you expose for this photo? Do you think your camera would select the right aperture or shutter speed if you selected the one you wanted? Do you meter on the sky or the rocks? Anyone is welcome to join the conversation. Good point, Al. I probably wasn't very clear when I was "waxing" philosophical. Yes, I use the "priority" settings fairly often (the AP alot, the SSP less so). But I still don't (usually) "let" the camera make the other decisions for me. That's why our cameras have exposure adjustment buttons. POINT is, there are many different ways to use the tools we have. But Al is absolutely right about one thing: You (almost) never want to have the camera making those decisions. If you are going to do that, you might at well go out and buy a cheap P&S and do just that -- P&S. My comment about using the AP mode was -- I thought -- prefaced with the comment that in order to use and understand any of those "modes" offered by the camera, you have to first understand fundamental exposure theory. If you don't, you are relying on a computer to "think" for you. If you understand what it is doing, then you can use the tool and monitor things. For example, in Al's example, if I know I am shooting that "snow" scene, I can override the camera's "choice" of shutter speed (assuming I am using AP). But I have to know enough to do it, or I will get, as Al points out, "grey" snow (not very compelling). At its very lowest common denominator, a camera is a "light-tight-box" with a lens attached. We can only control 3 variables: shutter speed, aperture, and sensor sensitivity (ISO). Working in full manual gives you complete control and perhaps better stimulates you to think about things Al points out. Using AP is a "lazy" way of "choosing" the aperture I want to shoot at, but it doesn't excuse me from thinking about shutter speeds, and if appropriate, adjusting the "choice" the camera has made. I can look at it and either "agree with it" or change. I think Al's point is: I have to DO that (and may be less likely to consider it if relying on the mode). With where you (Dean) are at today, I would be inclined to agree with Al: By all means, use full manual and use it until those issues become second nature. It makes you think about what you are doing and why when it comes to exposure. Of course, there is much more. As Al points out, you have to understand not just how you are metering and exposing, but what you are metering and what it will do to the overall image. Again, in his example, if I meter on the snow, I have to adjust (rule of thumb 1 1/2 to 2 stops "open" -- will vary with conditions, particular camera, ISO, etc.). But I can also meter a "neutral" grey card (or rock or tree trunk) in that exact same light and image area and shoot it dead on and I should get white snow. In that case, if I open up 2 stops, I will have a blown out shot. It is also important to understand the technology in your camera's light meter. In the days of film, I used the "spot" metering feature almost exclusively (I would still do it now, except that I cheat and use the histogram now -- another discussion for another time). The "matrix" or "honeycomb" metering technology is pretty amazing. But it can tend to "fool" you (again, because its an object -- it doesn't think -- it just does the same thing over and over again). It is designed to take the whole "scene" into consideration and make the "best" guess at proper exposure. But in a high contrast scene, how can it possibly know what you, the photographer, thinks are the important parts of the scene to properly expose. Again, I would robustly recommend the Bryan Petersen "Understanding Exposure" book. He does a much better job than I of explaining all this. Looking at Al's example photo, I would have to agree with him that in those kinds of situations (very high contrast differential) and others, like foggy conditions, or where there is one very important element in the image that must be exposed correctly, I would switch to all manual -- just too difficult at that point to let the camera do ANY "thinking" for me. The other time I would always use all manual is where I wanted to expose for an area or element, and then move the camera position. I am really shooting in "manual" -- just using the tools in my camera when it makes things quicker or easier. I absolutely understand what you are saying and I also understand how letting the camera make any decision can drive you toward some undesirable middle ground. My only comment would be that the scene in question is a pretty tough one for the computer but also for a photographer like me. Being completely honest, I have a whole collection of shots like this where I have just not gotten the shot. From underexposed foregrounds to washed out skies, this is the kind of picture where I struggle to get all the components properly exposed. Where I can absolutely see the human element saving the day is that I, unlike the camera, would likely shoot the scene based on my best guess, look at the resulting image and histogram, and then try to make any necessary adjustments and try again. The computer's algorithms are going to come up with the same settings over and over again as long as the inputs remain the same. And this is where I really get onboard with what you and Andy are saying as the other critical difference between myself and the camera is that I can (believe it or not) learn. If I shoot manually and either get the shot or miss the shot, I am creating learning opportunities. This scene will be repeated again in my future and, based on what I learn from this shot, I will be faster in dialing in my camera next time and faster the time after that and so on. As I mentioned, I have tried and failed at images like this in the past and I know that I have to chalk most of that up to inexperience. But, it seems like HDR and layers exist, at least to a degree, because of situations like the one presented in your example. When confronted with a really difficult picture, do you ever shoot for raw material knowing that you will have to combine two or more shots into a final one to get the components all in a single image? When you asked about which would I expose for, the sky or the rocks, I had an inclination to say "both" with an eye toward a session at the computer being necessary to make the end product. But from your comments about the actual image, I got the impression that you nailed it with resorting to stacking and layering. Is that the case all the time, is what I guess I am asking? I assume that the desire is always to get the picture as close to perfect as possible when captured but with the way that HDR programs are advertised, it seems like there is a work-flow that seems based on two wrongs making a right. Thank you both for letting me/us pick your brains (man, that is an unpleasant cliche when you just wanted an episode of the WAlking Dead on AMC). What a great post. I am picking up a lot the past week or two here on the forum from our most experienced photographers. I am still sometimes a fly by the seat of my pants kind of photographer. It makes me crazy sometimes, because I "think" I have the knowledge, and it should be easy for me to get the right exposure the first time I make my settings and click the shutter, but, it doesn't always happen for me. Back up to about 4 years ago before I have my first DSLR. I was shooting with a Panasonic "bridge camera" (I loved that thing and learned so much using it.) I gave myself an exercise where I would shoot in Manual only for one month straight......I couldn't cheat and go back to P or A or S. It was a fantastic exercise and it forced me into having to think about how to make the exposure and it gave me a great experience. I highly recommend this to everyone who is learning. 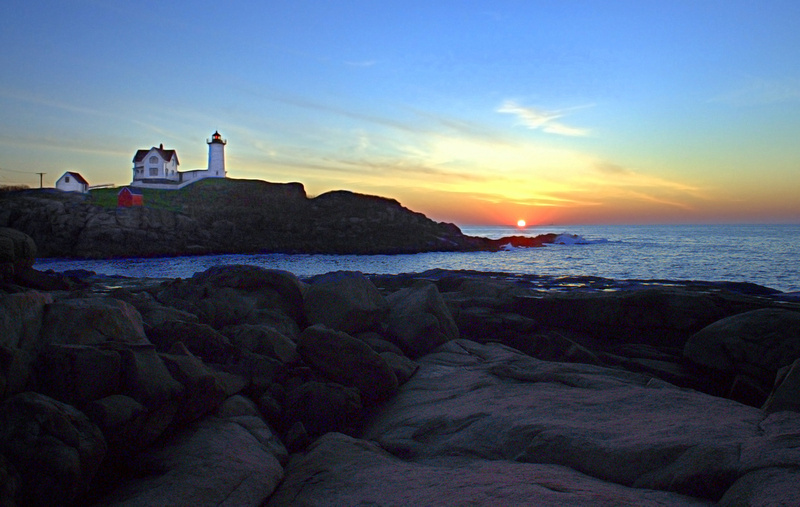 Last weekend my friend and I drove up to Nubble Light for sunrise. For reasons I don't want to get into , we arrived later than we anticipated. We wanted to be up there at least a half hour before the sun rose to get into place, to catch the brilliant colors of the sky before the sun made it's appearance etc. Well, we arrived just minutes before the sun rose. Of course there were other photographers in all of the good spots already set up with their tripods. We had to quickly find a decent spot, scramble down on the rocks to get there, make sure we weren't in anyone's way who was there before us, set up our tripods, take a few quick shots, and within a minute or two the sun made it's apperance on the horizon. It was way too much pressure for me. The scene reminds me of Al's scene, as there was a lot of high contrast areas between dark and light. I was frantically trying a few different setting. I would either get the sky right with no blinkies if I metered off the sky, but then the lighthouse and rocks would of course be in sillhouette. What did I do?????? I went into panic mode, switched my camera to "P" and made my exposres using the exposure compensation button. Here's my best shot of the morning. The exif info is ridiculous.....but in panic mode this is what I got. 1/320, f9, -3ev shot in P mode. I also had to do a lot of processing on this by opening up the dark areas. There's a lot of noise in this image. See what I mean? Fly by the seat of my pants. If I knew how to do HDR photography it would have been soooooooo much easier for me and I know I would have been able to get a much better image, that would be useable to print. As Al's image..........I am interested to see what anyone would have done in this scenario. Dean: Let me respond to a couple of your comments. Will be interesting to hear Al's take. You comment that being in control, you can make your "best guess." Its way better than that. By shooting "manual" you have complete control. No "guessing" involved. You just have to understand 3 things: (1) how the relationships between Shutter Speed and Aperture work, (2) what your metering is measuring and (3) what the limitations of your equipment are in a given situation. The latter is usually the clincher. There will be some situations where you simply cannot capture and then display all the information in the scene because the contrast difference is so high. The human eye can see hundreds of steps (lets say the equivalent of f-stops more currently referred to as exposure values -- "EV") of EV. The camera (currently) can capture and display on screen or print maybe 8 steps. So our eyes fool us. The camera can only capture whats within its limitations. Because of this, in every image you make, you have to make some exposure decisions. This is what Al and I are saying. YOU want to make those decisions. "Automatic settings" (including the "P" setting, Carol, ) take that decision making process out of your hands -- usually with poor results. You want to look at an image and decide what are the important areas in the photograph to expose. Dean, you can't say "all." Its not an option . You then can meter for those areas and expose for them. If you know the limits of your equipment, you know how much you can adjust for under or over exposure. In 90 percent of the images I have; in good light; I am able to find a well exposed image without resorting to layering or HDR or the like. Yes, you can use Layers and HDR and blending, and masks. Most of that stuff is available in a traditional chemical darkroom too (perhaps not HDR). It becomes another tool in our bag. But we don't want it to become our only tool, or worse yet, a crutch. There is a very real phenomena out there, with the advent of digital imagery, that I'll just shoot it and then I can go home and fix it in Photoshop. When computers first came out, my dad the engineer, had a favorite saying: "garbage in; garbage out." You have to make technically sound images in-camera to have any hope of them being very good even after PS post processing. That means you have to turn off all the auto stuff and learn to use the camera by you controlling all the variables. Yes, I (pretty sure Al does, too) sometimes look at a scene and say this one is a candidate for HDR, and then purposely shoot, as you call it, raw material, for a later blend. But again, I'll hold to my statement above, that in most situations, while I might get a result I like better with blending / HDR, I can bring home a single exposure image that will be well exposed. I know I sound like a drum here, but seriously, look at that Petersen Book. Really cogent explanation of these very critical fundamental principles. Thanks for the great discussion, Dean! Carol: A little bit of what I said to Dean. You have to understand the limitations of your equipment/situation. Sunrise is, in my view, often the most dramatic and nice lighting of the day. Whether it presents difficult contrasts depends an awful lot where you are standing in relationship to it. In this image, you look like you are shooting "at" the sun. There really cannot be a higher contrast situation. If you shoot at the twilight, when there is just some glow on the horizon, you usually have the ability to shoot longer exposures of the foreground without burning out the horizon. But as the sun intensity comes up, its just not possible using traditional technique. So, again, the process is to first decide what part of the image is important to expose properly. This may depend on what you are trying to have as a result. If you expose the sun properly (don't ever look at the sun, ESPECIALLY through a lens/viewfinder), you are going to get a sillouhette of the other elements, with the possible exception of the sky. If you expose the rocky foreground elements properly, the sun and probably the sky will completely blow out. Easiest (and you really need to go with full manual on this one) is to point the lens at the medium blue portion of the sky (upper left is good in this image), and use spot metering. Make your setting and then leave it. When you re-compose, your meter is going to tell you you are way off, depending on what it is point at. Ignore it. Compose and shoot. This will often give you really good compromise of details between highs and lows (similar to having a grey card exposure). If you have time (sounds like you didn't), meter the brightest area near the sun (remember DO NOT look at the sun through your camera, unless you just don't like your retina! ), remember or record the exposure; then meter the darkest area in the photo that is important to you to have detail (probably the foreground rocks), remember that exposure. Now, count the number of stops between them. If it is more than 5, you are probably just not going to be able to get this one. If it is 5 or less and you are shooting raw, shoot at the exposure for the most important part of the image (for me, I will generally favor the brighter exposure -- see the "Expose Right ...." Blog Tutorial for my rationale). I might then "bracket" between those exposures, if I am not completely sure where the most important area for details is. A third is to purposely shoot for blends or HDR. Al probably has more (and better) solutions. That magenta-looking cast in the rocks is likely "noise." There is always more noise in the shadows than in the brighter areas. It can be a function of the sensor, the shutter speed and ISO. What did you do in PP to open up the shadows? What ISO were you shooting at? Dean, thought you might be interested in my thinking when I exposed this shot. Shutter speed was the key consideration!...Really? Isn't this a static landscape photo? I learned long ago that the rotation of the earth means that exposures of the moon need to be less than 5 seconds. Anything greater than that and the moon starts to become oblong, a very unnatural appearance to say the least. So I set my shutter speed to 3 seconds. There is also the problem of the ocean. The water is moving. A fast shutter speed will stop its motion but a slow shutter speed like a half or full second makes the water look blurry. A longer shutter speed will give a more silky look to the water. So, there were a lot of considerations regarding shutter speed. Because of the bright sky and the dark foreground, I decided that the overall brightness was about average so I set my aperture to f4 as indicated by the camera's meter. I exposed the shot and checked the histogram. From the histogram I saw that I was losing detail in the blacks so I increased the shutter speed to 4 seconds. My ISO was set to 100 and I could have changed it but I try to shoot at as low of an ISO as possible. I'll go up to 400 on my Canon 40D, but beyond that, the photo just gets too grainy. I could have increased the ISO to 400 and that would have allowed me to use an aperture of f11 but I wasn't too concerned about the detail in the foreground rocks. I was expecting a silhouette. I also had to keep in mind that the sky was getting darker as night kept approaching. Less light in the sky meant I needed to let more light into the camera. Except for a bit of sharpening, the only adjustment I made in Photoshop was to increase the saturation and add a bit more contrast. Guessing at what settings you want isn't much better than letting your camera choose them for you. You need to think about what you are trying to accomplish. Will a fast or slow shutter speed make a better photo. Is depth of field an issue? Should you use a small aperture like f22 to get more of it or f2.8 to make it narrow? Think about what you want to do, choose a shutter speed or aperture that will accomplish that and most of the work is done. You can guess at the aperture setting but your guess is limited by the need for light. For example, there is rarely enough light to shoot at 1/1000 and f22 and ISO of 400. Once in a while I will shoot a scene with the idea of creating an HDR image, but I don't do that very often. Because I'm shooting in RAW, I can usually make adjustments in Adobe Camera Raw that will achieve my objective. This is would be a typical general approach to Al's subject - know that there always exceptions... First I am quickly (nanoseconds) asking myself...what are the subject(s) - and why are they important? What I do to absolutely make sure I get them? To me their are two subjects...the dead on beautiful sky and its gradations, color, and moon...and the wonderfully shaped rock formation that almost seems to cradle the "negative space of the sky and moon". Background... I always shoot Manual except on my Lumix pocket cams which I use Aperture setting - I always use Through The Lens (TTL) meter "multi-meter setting". 1. I know I can probably get a perfect exposure (based on Al's submitted image) for the sky...using the TTL. 4. I would focus somewhere around the edge of the rock formation so I can get a really crisp edge. 5. Al mentioned the rocks in FG are in silhouette so they don't play such a role in decision making - BUT that said Imight have to consider do I want an edge to them...if so then I would stop down maybe a bit more. 7. If the above checked out, then I would go to #6. If I blew out the moon a little I might adjust for a slightly faster shutter speed. 8. In a high contrast image like this - I know based on what I've done so far that the rocks subjects are going to be underexposed if the sky is perfectly exposed - and I don't want that because there will probably be too much visible"noise in the shadows" if I try to lighten up shadows later...and I want as clean a detail as I can get for elements that are subjects - within reason. I don't ever want to lighten up, or make more visible, noise if I don't have to. So, I will shoot a number additional frames (with slower shutter speeds) probably to "three stops up" for a "brighter image of the rocks" in mg - three intervals per stop. 8. I would later review the images in Bridge flag the best ones, export finals to a folder, then import that folder into my LR3 Catalog. Then be thankful you got to see this scene!!! Lucky Al. 8. Layer Masking. This is a really simple and extraordinary quick tool to composite. The following procedure would take me about10 minutes. 10. Import the image B with the "optimally exposed rocks" into PS. These are not necessarily really bright but have perhaps more detail...the total image IS of a silhouette...I want to keep the feel of the silhouette but perhaps have a little more detail...and I mean just a very little...this is about subtlety. 11. ABOUT THE PS TERMS - I am going to use some terms quickly w/o explanation - you can use lynda.com tutorials to get excellent help info from mega-pros like Deke McClelland, or just Google. 12. In image A I make a dup. layer of A, then I drag and drop image B into A...you can make two images align automatically in most versions of PS. I make sure image B is above A in the layer order and apply a layer mask and make it black. Now image A is only visible because a "black mask" is totally covering image B and making it invisible. 13. I choose the Brush Tool and make sure fg color is white...make it very soft edges (10 % hardness) and start out with about 10 % opacity and 50 % flow. Note these are not hard and fast rules...every photograph is different. NOTE - I NEVER EVER use the SAME tools, processes, ideas, and processing workflow for every image I shoot...because each one is different. It would be like if I decided to use my Cuisinart for ever single meal I prepare...I think we know that my Ribeye Steak Dinner in the Cuisnart would not yield shall we say...the most optimum results. 14. I left click the "black mask" icon to the right of the image B on it's layer slot. Now if I "brush" over the rock formation - I am removing the black mask, by painting on white...and ever so slightly letting image B start to appear. I might do this just enough to get some "detail back" - again so I don't have to brighten an underexposed image area which potentially has noise. 15. I might use same process with my #3 water alternate exposures - and can use layer masking to easily check to see if this is something I like or not. 16. Save your image as PSD file. Close and don't save the .RAW files that you opened. 17. In LR3 I would take the PSD and probably brush a tiny amount of brightness in the right edge of the center rock vertical - you can see some of it in Al's image especially at the bottom right...I might accentuate it...microscopically. 18. As you have or are getting LR3 I recommend that you immediately learn how to use this to further process the image. I only use PS for the above type of compositing, and removing unwanted objects as Al mentioned - but I never use it for color, sharpening, noise reduction or anything like that ...EVER, EVER, EVER. I would say this is the general rule now in professional photo processing at this point in time. The controls are far superior and of a finer nature - plus it's non-destructive. I would go to first link following purchase the tutorial set from Luminous Landscape by Michael Reichman and Jeff Schewe super pros and experts...it will be the best $50 bucks you can spend at this point. Carol fortunately brought up "blinkies" (also great photo and story!) - this and histograms are critically important tools to use along with TTL meter readings - especially for you at this point in your photo work. You can look into this a bit at the second and third links. I always have my DSLR cams set to show blinkies (blown highlight areas blink - another type of histogram) for the image being reviewed on my LCD. Sometimes I use the histogram...mostly only on my pocket cams. I would suggest you learn what these are and how to read them asap, asap, asap. Thank you for all of that. I need to read it a few times to digest all of it and also sit in my Adobe products and work through the workflows you broke out. Your #10 is right in an asthetic area that I want to explore more. It is similar to the HDR discussion that Andy I have had. Technology would let you couple a technically perfectly exposed set of rocks with a technically perfectly exposed sky but should you? As you rightly point out, this is, at its core, a silhouette and I get what you are saying that you should preserve that critical aspect. I mention this because it seems like (and please correct me if I am wrong) but when I talk about shooting raw material for a later edit, the photographer's mind must still be on the final image and not on just collecting the pieces. That is a great point and again goes right to Andy and Al's point on why the photographer and not the camera needs to decide what is actually "right". If I perfectly exposed on the rocks my final image will look well, pieced together because the overall light will not match what my mind knows had to be the real light. I want the rocks to be slightly under exposed and not perfectly exposed, right? Sorry if I basically just repeated your point with less brevity. Thanks for #18 too. Makes me even more hyped to get to work in LR but to also understand the role of each piece of technology. A software question on the whole layers idea. Does anyone use Perfect Layers and, if so, how much of an assist is it?